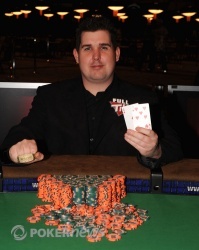 Congratulations to Scott Montgomery, Event #36 Champion ($481,760)! Two years ago Scott Montgomery was a part of the inaugural November Nine. While he came up short of a bracelet with a fifth place finish on that final table, he completed the job this time around by winning the bracelet this evening. While the payday for today's win may not come close to what he earned in the 2008 Main Event, it's the bracelet that's invaluable and perhaps his greatest accomplishment. Montgomery started the day with the second-shortest stack, but his aggressive playing style soon saw him propel towards the top of the table on his way to accumulating every chip in play. In addition to the bracelet, Montgomery will be walking to the cage to cash in a receipt worth $481,760. It'll be his second-largest cash to date and worth more than every live cash he's earned since making the Main Event final table two years ago. Congratulations to Montgomery for taking home the bracelet and walking away as champion of Event No. 36! 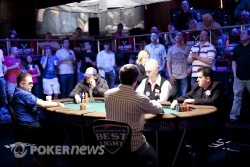 Stay with us at PokerNews through the rest of the series as we bring you more stories of accomplishment. Mick Carlson open shoved from the small blind for 825,000 chips, and Scott Montgomery called on the button. The board ran out and Carlson is our second place finisher. We took home $297,996. Mick Carlson limped in the small blind and Scott Montgomery popped it to 225,000 on the button. Carlson called. The flop was and both players checked. 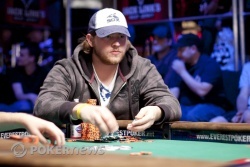 The turn brought a to the table and Carlson fired a 225,000-chip bet. Montgomery raised to 625,000 and was called. The river card was a and Carlson check-called a 1,000,000-chip bet. Montgomery tabled for two pair and took the pot. Scott Montgomery was fresh off a double up when he raised to 200,000 from the button. Adam Richardson was in the small blind and went all in for about 500,000. Mick Carlson folded and Montgomery made the call. For the second hand in a row Montgomery was able to nail the flop, this time landing a straight when it came . The turn added some drama when it came down , but Richardson got no help from the on the river. RIchardson soon took a seat at the rail and was heard cheering for Carlson, saying with a smile, "Let's go Mick Mack!" We're now heads-up with Montgomery in a huge chip lead. Four bets preflop led to Scott Montgomery putting himself all in preflop and Adam Richardson calling. Montgomery spiked a pair on the flop of and Richardson was unable to get back ahead with the on the turn and the on the river. After the hand Montgomery was over 5,000,000 in chips, and Richardson had 500,000. 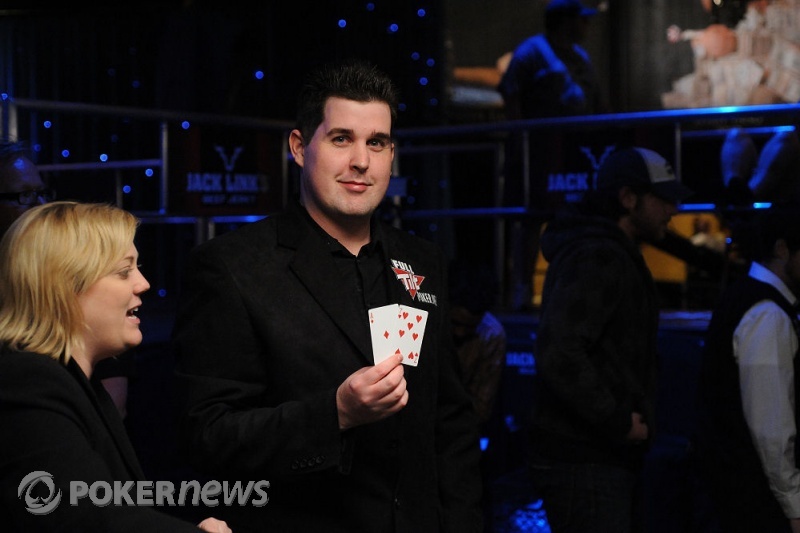 Mick Carlson just picked up two more pots after Scott Montgomery and Adam Richardson took turns raising preflop. 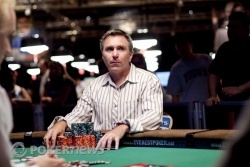 Carlson re-raised all in each time and too the pots down preflop. Adam Richardson opened the pot in the small blind with a 200,000-chip raise, and Mick Carlson called in the big. The flop ran out and Richardson fired a 200,000-chip bet. Carlson moved all in and Richardson tanked. Carlson is now up to 2,500,000 chips.